Google Chrome is unresponsive, relaunch now message can appear in Chrome usually when you try to open a link. This error will force you to restart Chrome and potentially lose your data, therefore today we’re going to show you how to solve it on Windows 10. According to users, one of the easiest ways to fix the problem is to update Chrome to the latest version. Make sure that Chrome is running. Click the Menu button in the top right corner. 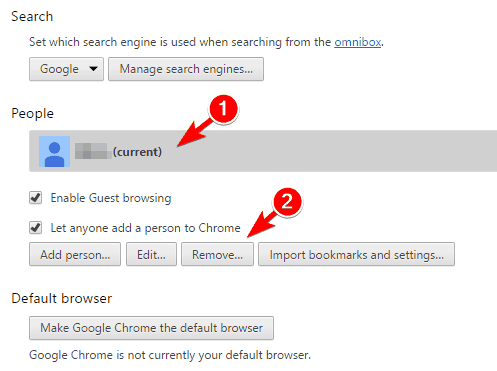 Navigate to Help > About Google Chrome. New tab will now appear showing you the current version of Chrome. 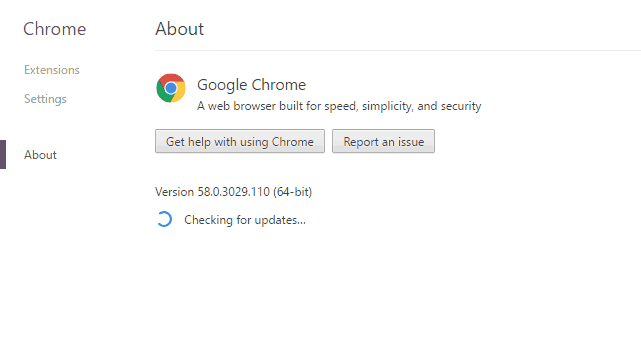 Chrome will now automatically download updates and install them. 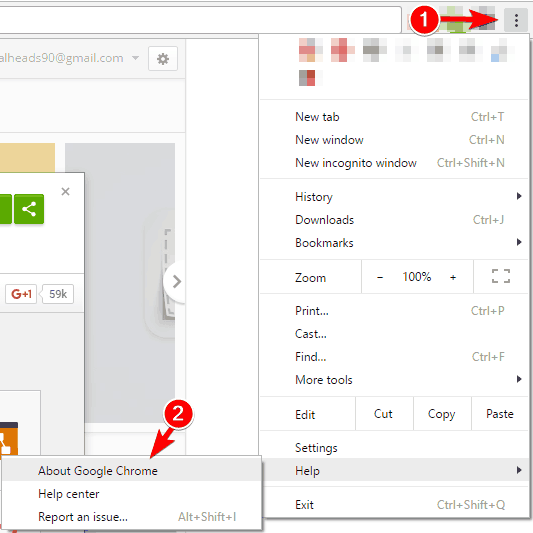 After updating Chrome to the latest version, check if the problem is resolved. According to users, the error is caused by a bug in Google Chrome and the simplest way to fix it is to update your browser. This is a useful workaround and it might help you with this problem. Users reported that the error message appears while trying to open a link in an email client. According to them, clicking a link in the email client causes Google Chrome to crash. Locate your email client’s shortcut. Right click the shortcut and choose Run as administrator from the menu. After doing that, your email client will start with administrative privileges and you’ll be able to open links without any problems. As we already mentioned, this is just a workaround so you’ll have to start your email client with administrator privileges every time in order to circumvent the problem. Locate your email client’s shortcut. 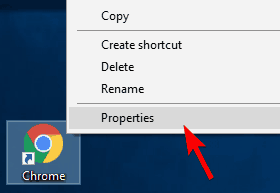 Right click it and choose Properties from the menu. 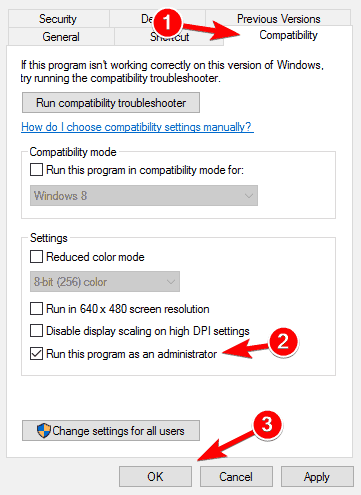 Navigate to the Compatibility tab and check Run this program as an administrator option. Now click OK and Apply to save changes. After doing that, your email client will always start with administrative privileges so you won’t have to do it manually. Several users reported that this problem occurs if Chrome is set to run with administrative privileges. Therefore if you’re already running Chrome as an administrator, try disabling Run this program as an administrator option. On the other hand, if Chrome isn’t running with administrator privileges, you can try running it as an administrator and check if that solves the issue. You can enhance Chrome with various extensions, but sometimes those extensions can cause Google Chrome is unresponsive, relaunch now message and other problems to appear. 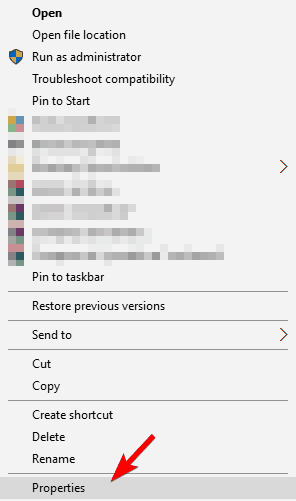 List of installed extensions will appear. Now you need to disable all extensions. 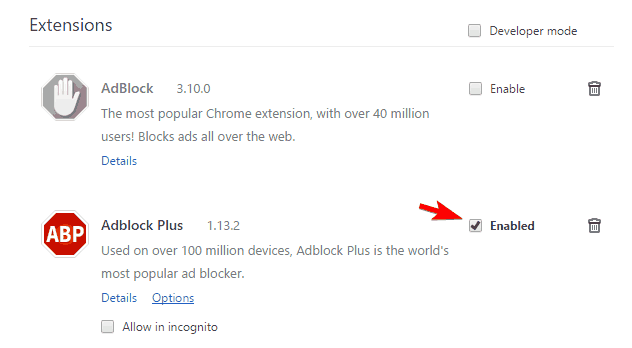 To do that, simply click Enabled checkbox next to the extension’s name. After disabling all extensions, restart Chrome and check if the problem still appears. If the problem doesn’t manifest, you need to go back and enable extensions one by one. After enabling each extension you need to restart Chrome and check if the problem appears again. After you find the problematic extension, disable it or remove it. If you need to use that extension, you might have to update it to the latest version and check if that solves the issue. Several users reported that Norton Security Toolbar extension was causing the problem for them, but after disabling it the issue was resolved. Other users reported this problem after disabling Google Docs extension, so if you have Google Docs disabled, be sure to enable it. Google automatically collects information about your browser whenever it crashes. Using this information developers can find bugs and errors and fix them in future versions. This is a useful feature, but sometimes it can cause Google Chrome is unresponsive, relaunch now message to appear. 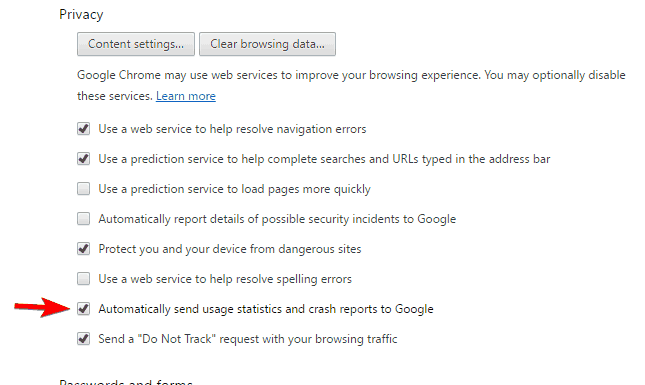 In the Privacy section locate Automatically send usage statistics and crash reports to Google option and disable it. After doing that, restart Chrome and check if the problem appears again. If you’re frequently getting Google Chrome is unresponsive, relaunch now message, you might want to try deleting your Chrome profile. Sometimes your profile might become corrupted and that can cause this and many other problems to appear. 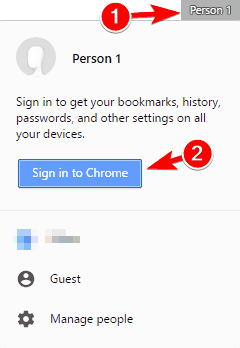 To fix this problem, you need to delete your Chrome profile and create it again. 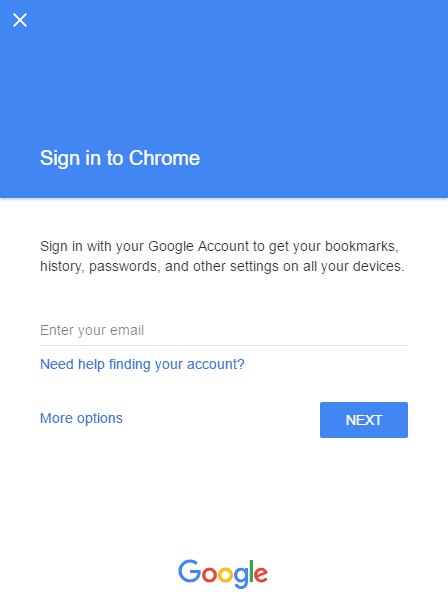 If you’re signed in to your Google account in Chrome, all your data will be stored in cloud, so you won’t lose any bookmarks or browsing history. If your account isn’t synced online, you might want to back up your profile beforehand. In the People section locate your profile and select it. Now click the Remove button. Confirmation message will now appear. Click the Remove button. Restart Chrome and navigate back to the Settings tab. In the People section click on Add person button. Select the desired picture, enter the name and click the Add button. New Chrome window will now appear. 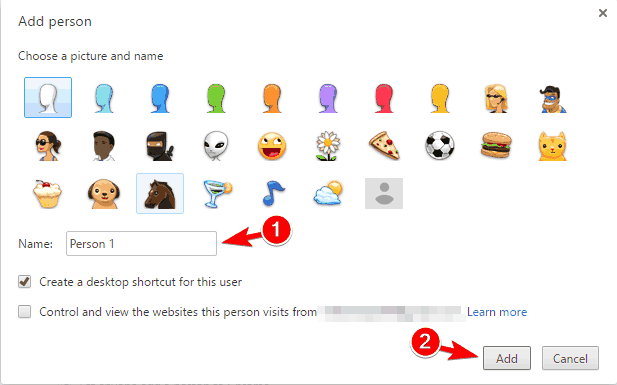 Click the name of your profile in the top and choose Sign in to Chrome. Now enter your email and password and you’ll have your account available again. Make sure that Chrome is completely closed. You’ll also have to close all Chrome processes. We explained how to do that in Solution 6, so be sure to check it out. 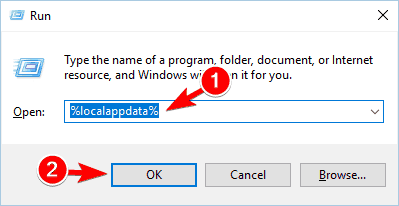 Local AppData folder will now appear. Navigate to GoogleChromeUser Data directory. Locate Default folder and rename it to Default backup. If the problem is resolved, it means that your profile was corrupted. 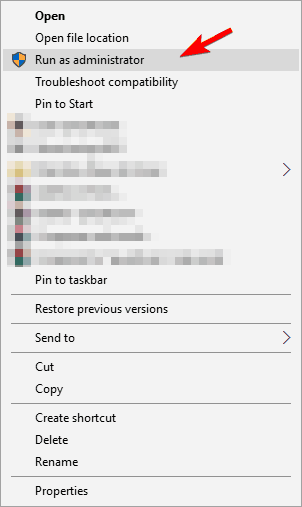 If needed, you can restore some parts of your profile by copying it from Default backup to the new Default profile. Sometimes Google Chrome is unresponsive, relaunch now message appears due to multiple Chrome processes running in the background. 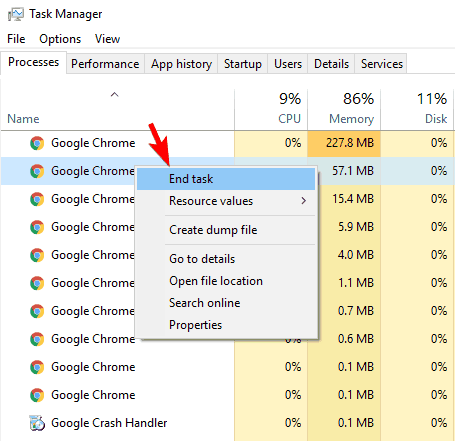 When Task Manager starts, locate all Chrome processes and right click each process and choose End Task from the menu. 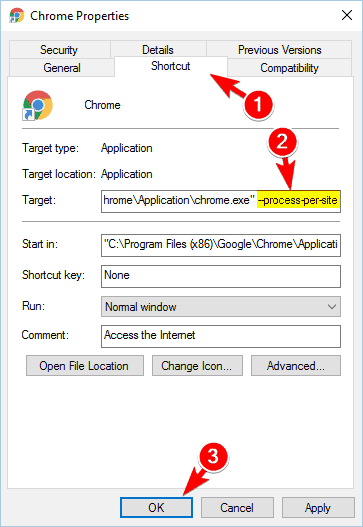 Keep in mind that Chrome processes will be located in both Apps and Background processes groups, so be sure to close them all. After doing that, start Chrome again and check if the problem still persists. Keep in mind that this is just a workaround, so you might have to repeat it order to avoid this problem. Malwarebytes is a great anti-malware tool, but according to users, it can cause this error to appear in Google Chrome. To fix the problem users are suggesting to remove it from your PC. Navigate to the System section. In the left pane choose Apps & features. Now select Malwarebytes in the right pane and click on Uninstall button. Follow the instructions on the screen to remove Malwarebytes. Press Windows Key + S and enter programs. Select Programs and Features from the menu. 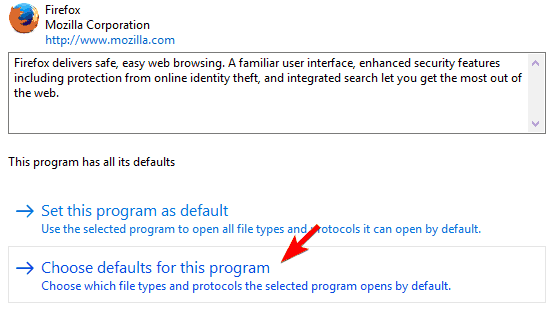 When Programs and Features opens, select Malwarebytes from the list and click on Uninstall option in top menu. Alternatively, you can just double click Malwarebytes to remove it. Follow the instructions on the screen to complete the uninstall process. If you need to use Malwarebytes, we suggest that you download and install the latest version and check if that solves the problem. If the Google Chrome is unresponsive, relaunch now message appears only when opening links in email messages, you can fix it by performing this workaround. Apparently this message appears if you click a link in your email client while Chrome is running. One simple workaround is to close Chrome completely and then click the link in the email message. After doing that, Chrome will start normally and you’ll be able to access the link without issues. Once again, this is just a workaround, so you’ll have to repeat it every time the issue appears. Alternatively, you can just copy and paste the link from your email client to Chrome as a temporary workaround. This isn’t the most effective solution, but it should help you with this problem, so be sure to try it. According to users, you might be able to solve this problem simply by adding a single parameter to Chrome. By default, Chrome starts a new process when opening a new tab, and sometimes this can cause Google Chrome is unresponsive, relaunch now message to appear. 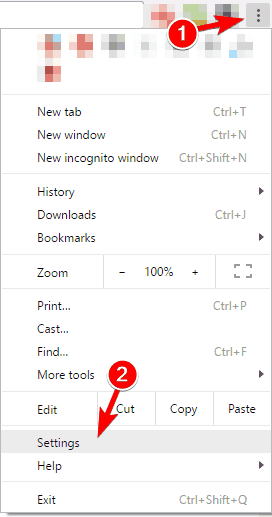 Locate Chrome shortcut, right click it and choose Properties from the menu. Go to the Shortcut tab and in the Target field add –process-per-site. Click Apply and OK to save changes. After doing that, Chrome won’t start any additional processes for every opened tab, and the issue should be resolved. Keep in mind that you need to use this shortcut to start Chrome every time. By using this shortcut you’ll ensure that Chrome is running with the necessary parameters. 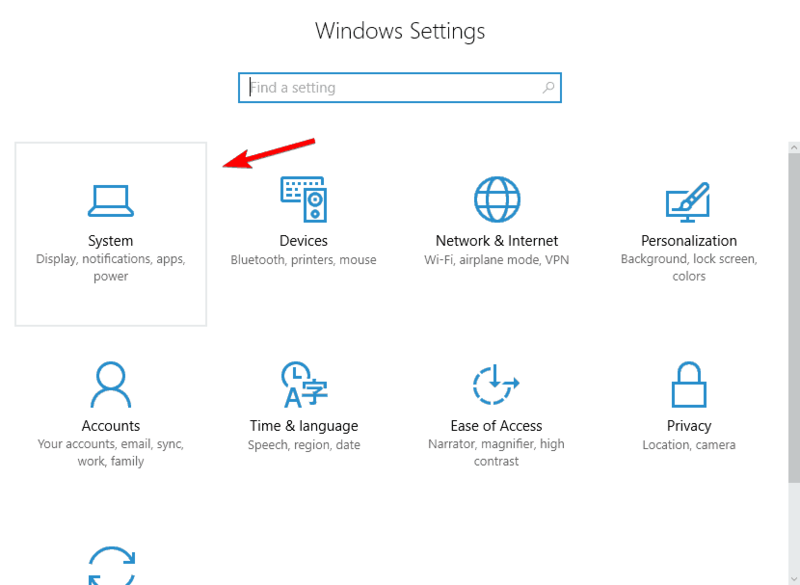 Press Windows Key + I to open the Settings app. Now navigate to the System section. 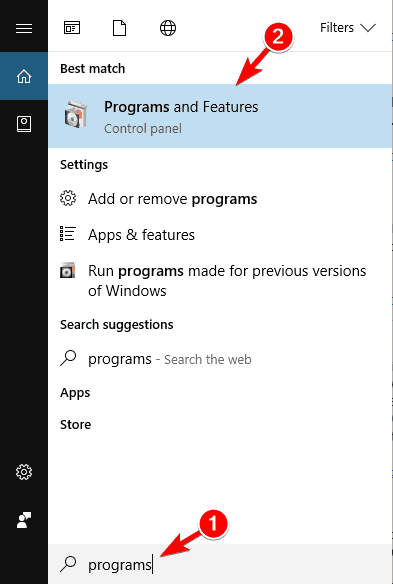 Go to Default apps section in the left pane. 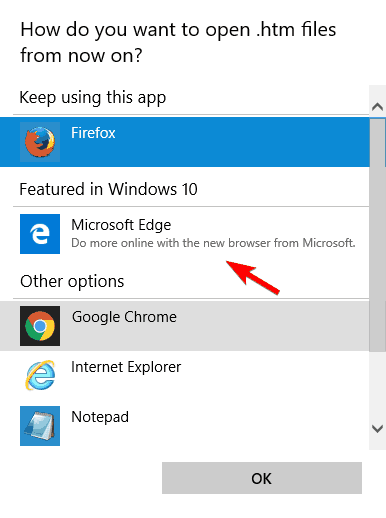 In the right pane, locate Web browser and change it from Chrome to any other browser such as Edge or Firefox. 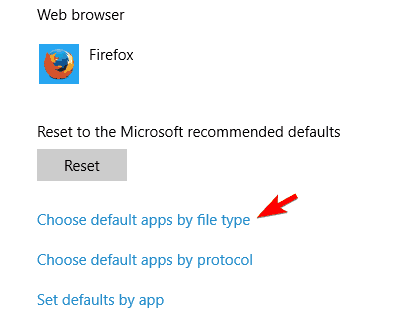 Now click on Choose default apps by file type. List of file extensions will appear. Locate .html and .htm and set the default application to any browser other than Chrome. When Control Panel opens, select Default Programs from the list. Now click on Set your default programs. 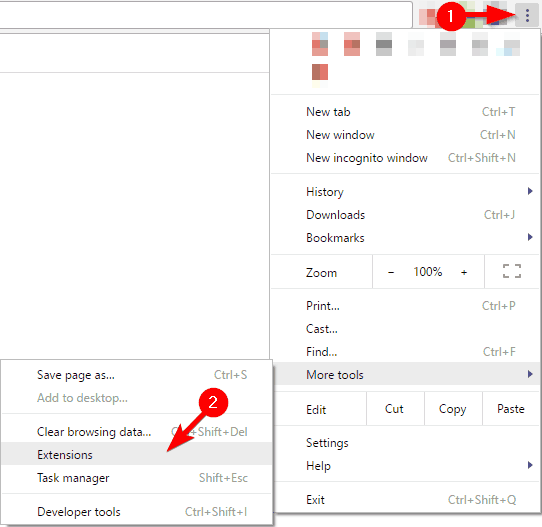 Locate the desired browser on the list and select it. Click on Set this program as default. 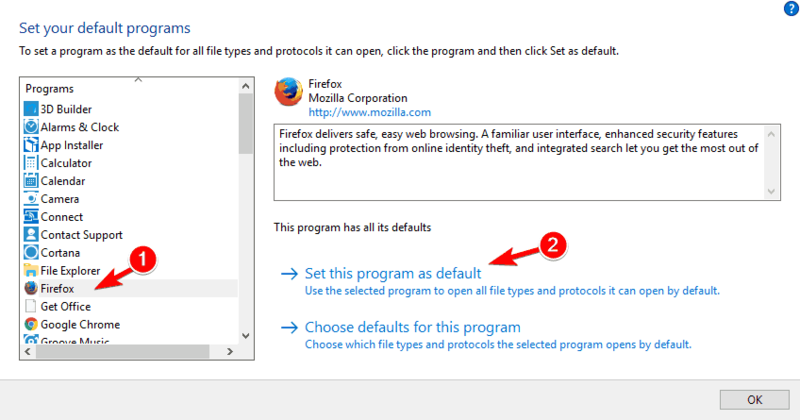 Now click on Choose defaults for this program. 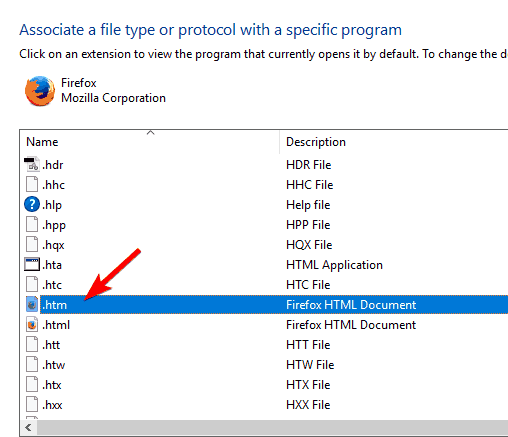 Make sure that .html and .htm files are checked. If you want, you can check all other options as well. Click Save to save changes. 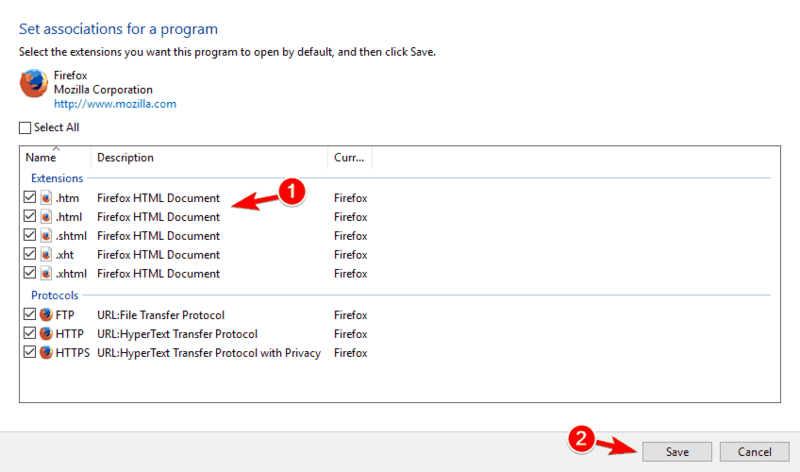 Now click on Associate a file type or protocol with a program. Locate .html and .htm on the list and double click them. List of suggested applications will appear. Select any browser other than Chrome and click on OK button. By following the steps above, you’ll set a different browser as a default. Few users reported that you can fix the problem by setting Firefox as a default browser and then setting Chrome as the default again. In addition, few users are also recommending to set your email client as a default email app instead of Chrome. 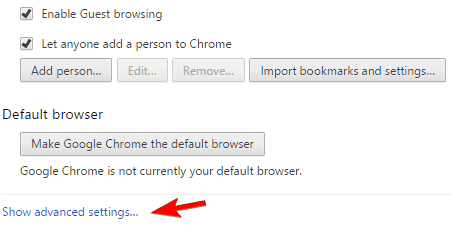 In Chrome click on Menu button in the top right corner and choose Settings. When Settings tab appears, scroll all the way down and click on Show advanced settings. Locate Privacy section and click on Clear browsing data button. 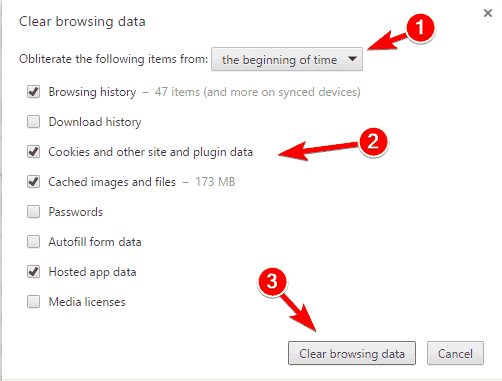 When Clear browsing data window opens, make sure to set Obliterate the following items from to the beginning of time. Check Browsing history, Cookies and other site and plugin data, Cached images and files and Hosted app data. Now click Clear browsing data button. After the cache is cleared, restart Chrome and check if the problem is resolved. 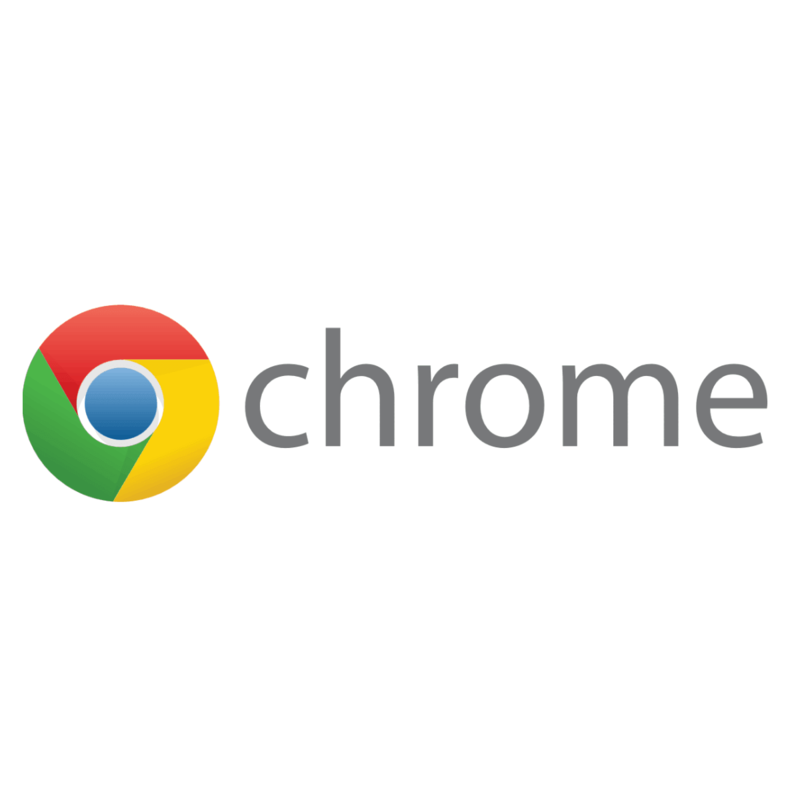 If the problem still persists, you might be able to fix it simply by reinstalling Chrome. Sometimes your Chrome installation can become corrupted and that can cause this and many other errors. To fix the problem, simply uninstall Chrome and then download the latest version. Few users are also recommending to download Chrome Canary, so you might want to try that as well. Keep in mind that Chrome Canary is an experimental version of Chrome, so although it offers many bug fixes, it can also be unstable to use. Google Chrome is unresponsive, relaunch now message can cause certain inconvenience, but you should be able to fix it by using one of our solutions. Feel free to tell us in the comments section below what worked for you or any other solution that helped you.